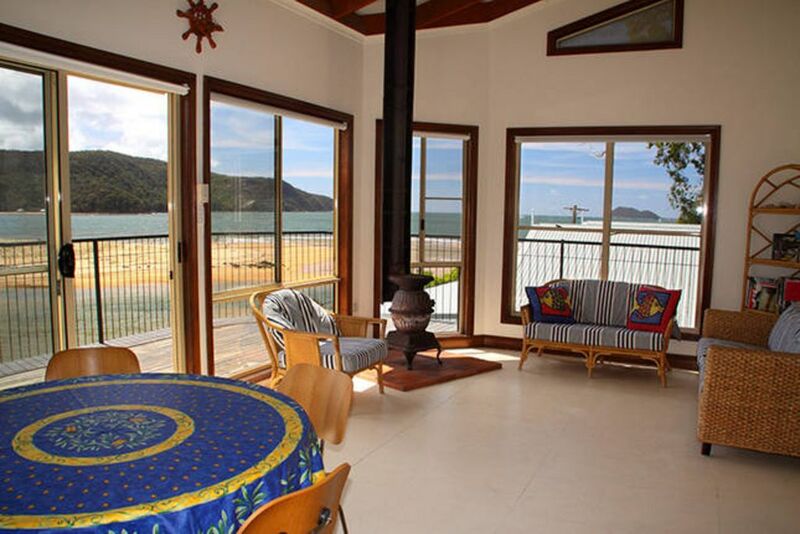 Patonga Beach House provides a wonderful escape destination. The house is on the beach, and faces north for all day sun. Immediately behind the house is the lovely Brisbane Waters National Park. The house has fabulous views down Patonga Creek and on the ocean side across to Lion Island and Barrenjoey lighthouse. A large north facing deck overlooks a beautiful swimming beach. Living and bedrooms all have stunning water views. One of the attractions of the house is that while close to Sydney, the location has a feel of being away from everything. Access to the house is via a short row (about 250 meters) across the Patonga Creek in our dinghy. Water only access means no roads, no traffic and the beach at your doorstep. If your rowing skills are a bit rusty, then we can arrange for our caretaker Hans to met you on arrival and show you the ropes. Just let us know if you need this service when you book. Once there you can choose from a variety of activities such as swimming, fishing from the supplied dinghy, beach cricket and ball games, kite flying, exploring the creek with the supplied kayaks, mucking around at the mouth of the creek on the surf ski, and enjoying the local bush walks. Or, you can just relax outside on the sheltered, sunny deck with a book or magazine from the house and watch the day go by. The deck looks over the beach, perfect for watching children while they play. The house comes supplied with TV/DVD and Bose stereo with CD & iPOD compatibility. Linen is provided. Patonga is a small fishing village - fabulous for an idyllic getaway. Surrounded on all sides by the beach, the creek and National Park, the village has an untouched atmosphere that is quite unique so close to Sydney. The village has a tavern, a general store and bottle shop, tennis courts, playgrounds and quiet streets for wandering down. Patonga Beach House has the National Park at its back fence. In fact, the Brisbane Waters National Park surrounds the entire village and there are many beautiful walks you can take. The scenery is magnificent, the bird life is spectacular and koalas can sometimes be seen in the local trees. We had a fantastic stay. From the creek crossing to the house, fishing, swimming,eating. Right down to the creek crossing back. Sad to leave. Comfy house. Fantastic views. Great company. All perfect. My husband and I were able to take our 2 dogs and 2 young children and have a beautiful winter escape at this lovely house with views that were out of this world- Peter & Hans were wonderful hosts, a big thanks to you both! We were worried about the creek access but it was fine. Hans helped us across the first time and he could not have been friendlier. We were fine after that. We loved the house. The kids loved the loft bed and the adults loved the view. We went walking up and down the creek at low tide and explored all the animals with the kids. It was even better than the pictures - beautiful views. I came on my own for two nights for school hols adventure with kids so it was great to have Hans to row/tow us over. Fun learning to paddle at high tide and swim/float with the currents at low tide. We’ll be back for sure as husband rather jealous and would like to try some of the local bushwalks and the Patonga pub which looked very nice driving by. The house not fancy but that is exactly what makes it comfy - kids loved the loft area (twins age 10 - for younger kids loft area not so suitable).